These words introduce the inspiring new CD Close Voices from Far-away released by Sony in the Czech Republic. 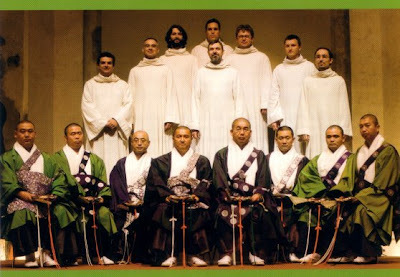 The mutual dialogue is provided by the Buddhist monks of Gyosan-ryu Tendai Shomyo from Japan and the Schola Gregoriana Pragensis from Prague, who are seen together in my footer image. The CD was recorded in a former Augustian monastery in České Lípě in November 2006, and was the brainchild of the Schola's founder David Eben. Close Voices from Far-away is both a moving musical experience and a remarkable work of scholarship. Sources and editions are listed, and the comprehensive documentation includes short essays on the Shomyo Chants, the Buddhist Liturgy, the Tendai school of chant (Gyosan-ry Tendai Shomyo) as well as Gregorian Chant. Hearing the two vocal groups individually is a privilege. But hearing the two ensembles singing together and layering Buddhist and Greorian Chant on two of the tracks takes us into a unique sound-world that is more contemporary than medieval. Read a fuller appreciation of this remarkable release here. Close Voices from Far-away is not easily found outside the Czech Republic. I bought my copy online from cdMusic.cz who provided a very fast and problem free service. Here is a link to the CD on their site. I will be playing music from Close Voices from Far-away on my Future Radio programme this Sunday December 2 at 5.00pm UK time. The Buddhist and Gregorian Chants will be interleaved with music from Philip Glass' score for Kundun. This film by Martin Scorsese depicts the exile of the 14th Dalai Lama from Tibet. Both Close Voices from Far-away and Kundun are vivid reminders of the Buddhist culture that is under continued threat from the Chinese occupation of Tibet. Now follow the Buddhist way with Lou Harrison. And remember that at 12.01am UK time Wednesday December 5 Future Radio is giving the world broadcast premiere of Alvin Curran's complete Inner Cities, with an introduction from pianist Daan Vandewalle. Full details of this webcast here. A side path here that has echoes of the recent posts about Belgium. This region is still, wrongly, referred to as Czechoslovakia. Following the collapse of Soviet authority in 1989, Czechoslovakia regained its freedom through a peaceful "Velvet Revolution." On 1 January 1993, the country underwent a "velvet divorce" into its two national components, the Czech Republic and Slovakia. The Czech Republic, which includes Prague, is, together with Estonia, one of the most non-religious countries in the European Union. The 2001 census recorded that 59% of the country were non-believers. Slovakia is more God-fearing. 70% are Roman Catholic, and 11% Protestant. The link to cdMusic.cz is dumping me onto the front page and I can't find the CD you review here. Keith, you are right. I had the devil's own job finding it again on cdMusic.cz, I couldn't even track it back from my order! Finally I did. The link is below, and I've also modified the link in the article. Thanks for pointing out the problem. As I said the delivery was fast, the order and payment pages are In English. It all works, when you find the CD!